knowhere—the exhibitAn investigation into how to teach wayfinding design without boring students to tears. Or, more professionally stated, teaching how context and behavior influence navigation. Knowhere started as an observation that contemporary wayfinding design tends to focus on signage layout over how people might actually move through a space. 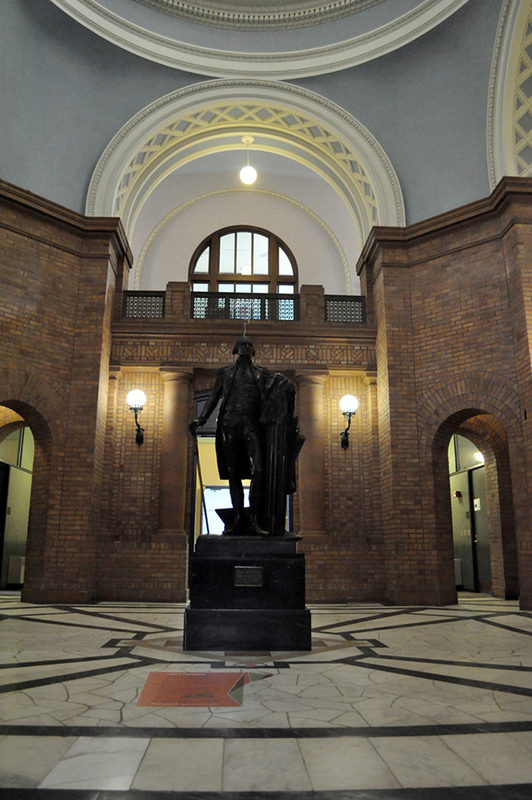 In an attempt to educate undergraduate students of architecture, interior design, and graphic design on issues concerning wayfinding usage, an emersive education model needed to develop. 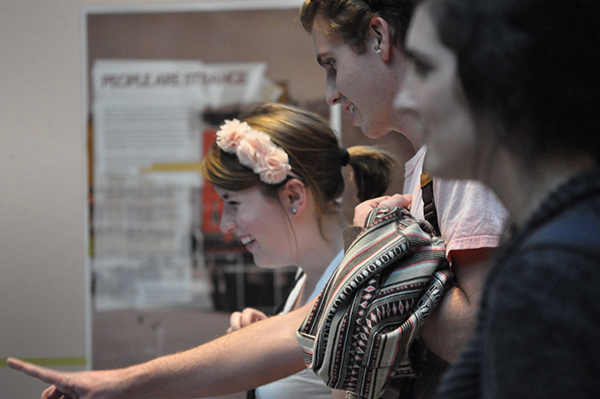 Lessons learned from this investigation were then applied back at Miami University in the form of an exhibit installation. 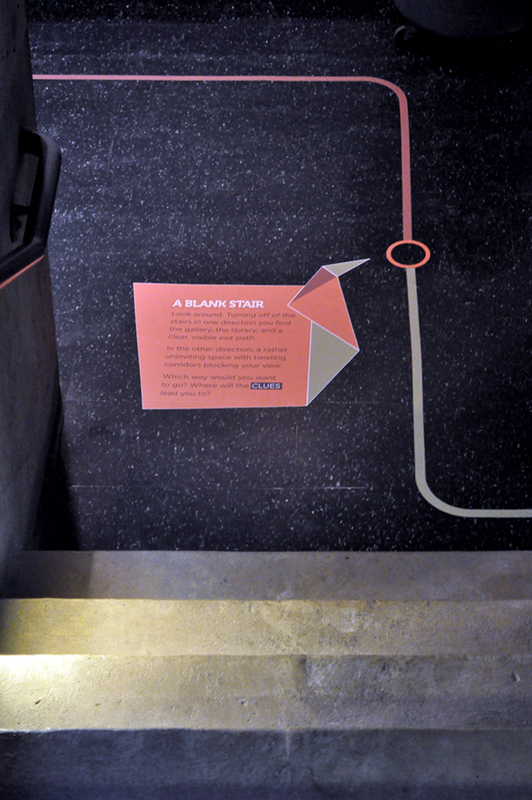 The exhibition points out how behavior and environmental context can aid in navigation decisions, in an effort to determine a better method of teaching wayfinding design to students and potential clients. By using the building in which it's housed as a teaching tool, the Knowhere Exhibit does something never done within the context of this academic setting before—it pulls itself out of the confines of the gallery space, and lets the design overrun a full level in the Miami University Department of Architecture and Interior Design. The exhibit starts a conversation between the visitor and building by pointing out moments of decision-making, questioning whether the context of these moments works. It encourages people to look at their surroundings and determine what in that place is influencing their understanding of location and sense of place. The procession from the entry to the space culminates in the arrival at a room, devoid of furnishings save one table with a continually looping video. 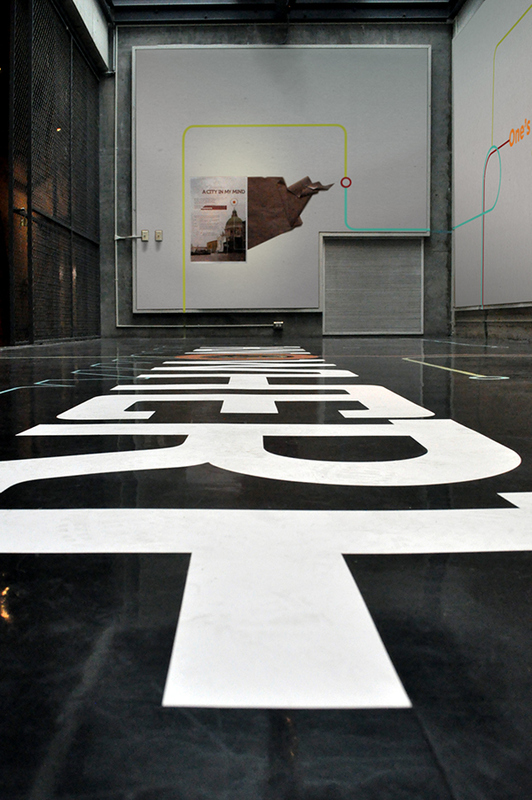 The space itself is activated only by the super-graphic installations along the walls, and the posters explaining how context, behavior, and semiotics can be used to lead. By turning the venue into part of the installation, and encouraging the interaction of visitors with the spaces, KNOWHERE asks the question of how can graphic design influence how people respond to and move through space. 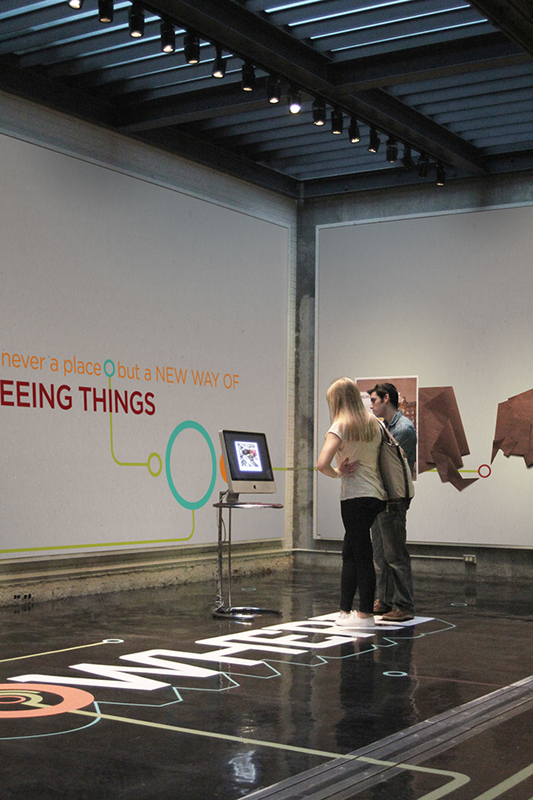 It further challenges visitors to make their own decisions about how graphics can activate a space, and how that in turn influences behavior and navigation in that space. 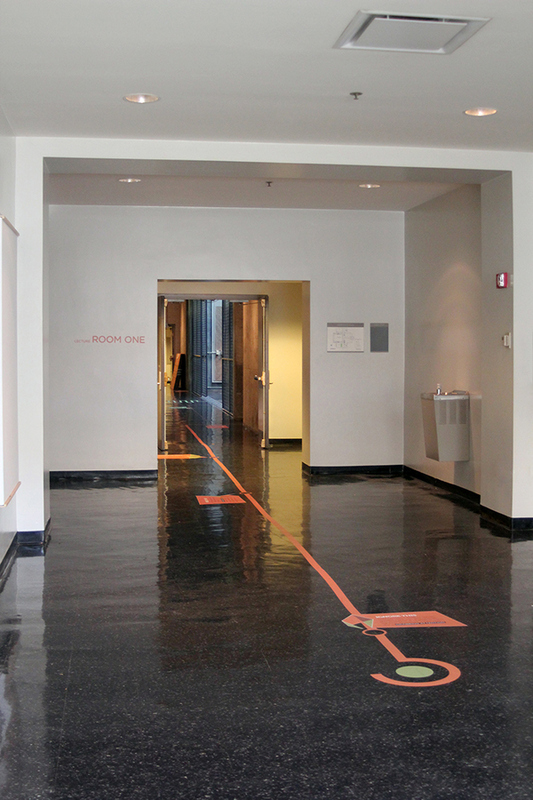 An investigation into how to teach wayfinding design without boring students to tears. Or, more professionally stated, teaching how context and behavior influence navigation. Knowhere started as an observation that contemporary wayfinding design tends to focus on signage layout over how people might actually move through a space. 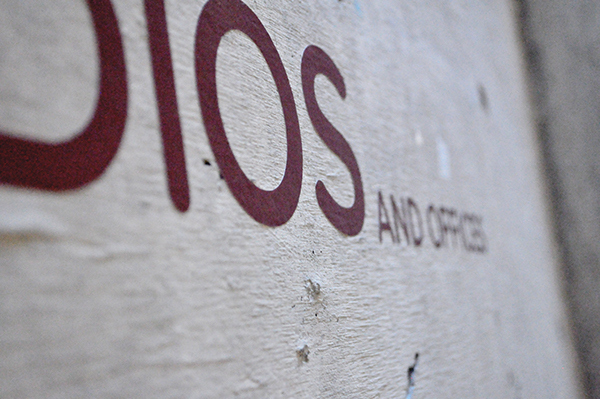 In an attempt to educate undergraduate students of architecture, interior design, and graphic design on issues concerning wayfinding usage, an emersive education model needed to develop. 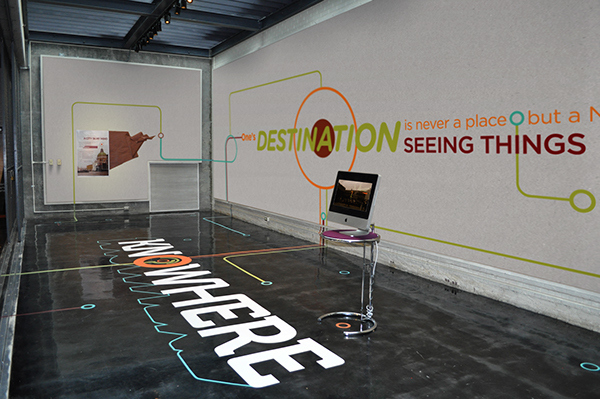 Lessons learned from this investigation were then applied back at Miami University in the form of an exhibit installation. 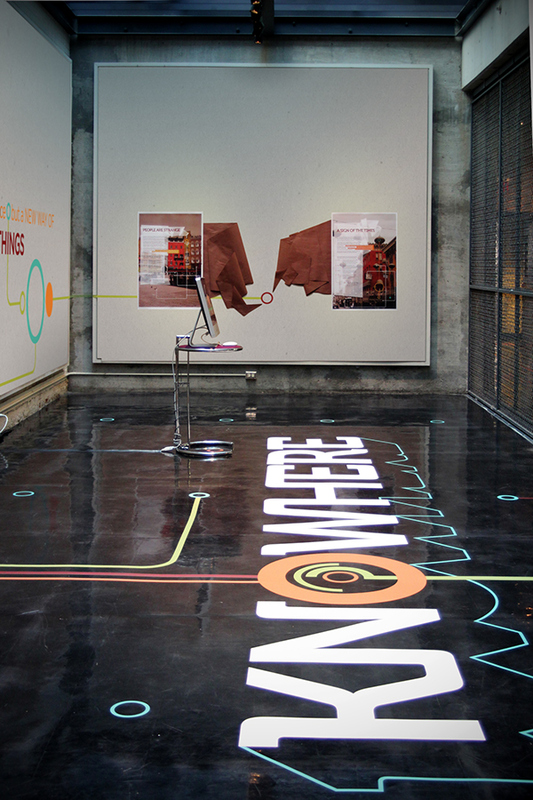 The exhibition points out how behavior and environmental context can aid in navigation decisions, in an effort to determine a better method of teaching wayfinding design to students and potential clients. 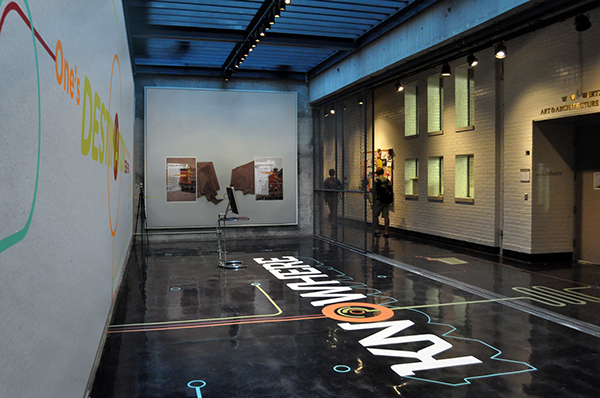 By using the building in which it's housed as a teaching tool, the Knowhere Exhibit does something never done within the context of this academic setting before—it pulls itself out of the confines of the gallery space, and lets the design overrun a full level in the Miami University Department of Architecture and Interior Design.